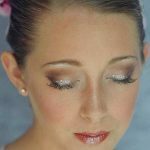 This stage makeup look designed for the Nutcracker Ballet character Sugar Plum Fairy and the Land Of Snow can be applied over an already made up classic stage look or from the start fresh. If you are not clear on the application of the Classic Stage Face be sure to learn that first before these Sugar Plum additions. Where traditional ballet makeup is required keep in mind that the brows need a little more enhancement and extending. Eyeliner will need to be extended a bit further at the ends. Be sure to not meet the lower and upper lines at the sides. Click on highlighted products to view. This look features Mode Dion’s 5 Color Pro Pallet eye shadow. For a softer look use the eye shadow you define the eyes with (Define 2 Burgundy shown) as the eye liner below lower lashes and the black shadow/liner at the outer end of the eye corner along upper lashes. Keep eyes wide with white pencil in between. Add a little white shimmer like Mode Dion’s Shimmer Pot to the center of lid, brow arch and inner eye corner to open eyes even more. False lashes will be a must to create big elegant eyes. Adding a bit of magical glimmer to the cheekbones and eyes can really create more enchantment. Use Diva Glue to secure glitter in opal/white Mode Dion’s Crystalina.